We have selected the incident of this apostolic election as the central point round which to group the events of the ten days’ expectation which elapsed between the Ascension and Pentecost. But though this election is a most important fact, in itself and in the principles involved therein, yet there are numerous other circumstances in this waiting time which demand and will amply repay our thoughtful attention. I There is, for instance, the simple fact that ten days were allowed to elapse between Christ’s departure and the fulfilment of His promise to send the Comforter to take His place with His bereaved flock. The work of the world’s salvation depended upon the outcome of this Divine agent. "Tarry ye in the city till ye be endued with power from on high"; and all the time souls were hurrying on to destruction, and society was becoming worse and worse, and Satan’s hold upon the world was daily growing in strength. God, however, acted in this interval according to the principles we see illustrated in nature as well as in revelation. He does nothing in a hurry. The Incarnation was postponed for thousands of years. When the Incarnation took place, Christ grew up slowly, and developed patiently, till the day of His manifestation to Israel. And now that Christ’s public work on earth was done, there is no haste in the further development of the plan of salvation, but ten days are suffered, to elapse before His promise is fulfilled. What a rebuke we read in the Divine methods of that faithless, unbelieving haste which marks and mars so many of our efforts for truth and righteousness, and specially so in these concluding years of the nineteenth century. Never did the Church stand more in need of the lesson so often thus impressed upon her by. her Divine Teacher. As Christ did not strive nor cry, neither did any man hear His voice in the streets, so neither did He make haste, because He lived animated by Divine strength and wisdom, which make even apparent delay and defeat conduce to the attainment of the highest ends of love and mercy. And so, too, Christ’s Church still does not need the bustle, the haste, the unnatural excitement which the world thinks needful, because she labours under a sense of Divine guidance, and imitates His example who kept His Apostles waiting ten long days before He fulfilled His appointed promise. What a lesson of comfort, again, this Divine delay teaches! We are often inclined to murmur in secret at the slow progress of God’s Church and kingdom. We think that if we had the management of the world’s affairs things would have been ordered otherwise, and the progress of truth be one long-continued march of triumph. A consideration of the Divine delays in the past helps us to bear this burden, though it may not explain the difficulty. God’s delays have turned out to His greater glory in the past, and they who wait patiently upon Him will find the Divine delays of the present dispensation equally well ordered. II Then again, how carefully, even in His delays, God honours the elder dispensation, though now it had grown old and was ready to vanish away. Christianity had none of that revolutionary spirit which makes a clean sweep of old institutions to build up a new fabric in their stead. Christianity, on the contrary, rooted itself in the past, retained old institutions and old ideas, elevating indeed and spiritualising them, and thus slowly broadened down from precedent to precedent. This truly conservative spirit of the new dispensation is manifest in every arrangement, and specially reveals itself in the times selected for the great events of our Lord’s ministry—Easter, Ascension, then the ten days of expectation, and then Pentecost. And it was most fitting that it should be so. The old dispensation was a shadow and picture of the higher and better covenant one day to be unfolded. Moses was told to make the tabernacle after the pattern shown to him in the mount, and the whole typical system of Judaism was modelled after a heavenly original to which Christ conformed in the work of man’s salvation. At the first Passover, the paschal lamb was offered up and the deliverance from Egypt effected; and so, too, at the Passover the true Paschal Lamb, Jesus Christ, was presented unto God as an acceptable sacrifice, and the deliverance effected of the true Israel from the spiritual Egypt of the world. Forty days after the Passover, Israel came to the mount of God, into which Moses ascended that he might receive the gifts for the people; and forty days after the last great Paschal Offering, the great spiritual Captain and Deliverer ascended into the Mount of God, that He, in turn, might receive highest spiritual blessings and a new law of life for God’s true people. Then there came the ten days of expectation and trial, when the Apostles were called to wait upon God and prove the blessings of patient abiding upon Him, just as the Israelites were called to wait upon God while Moses was absent in the mount. But how different the conduct of the Apostles from that of the more carnal Jews! How typical of the future of the two religions — the Jewish and the Christian! The Jews walked by sight, and not byfaith; they grew impatient, and made an image, the golden calf, to be their visible Deity. The Apostles tarried in patience, because they were walking by faith, and they received in return the blessing of an ever-present unseen Guide and Comforter to lead them, and all who like them seek His help, into the ways of truth and peace. And then, when the waiting time is past, the feast of Pentecost comes, and at Pentecost, the feast of the giving of the old law, as the Jews counted it, the new law of life and power, written not on stony tables, but on the fleshy tables of the heart is granted in the gift of the Divine Comforter. All the lines of the old system are carefully followed, and Christianity is thus shown to be, not a novel invention, but the development and fulfilment of God’s ancient purposes.36 We can scarcely appreciate nowadays the importance and stress laid upon this view among the ancient expositors and apologists. It was a favourite taunt used by the pagans of Greece and Rome against Christianity that it was only a religion of yesterday, a mere novelty, as compared with their own systems, which descended to them from the dawn of history. This taunt has been indeed most useful in its results for us moderns, because it led the ancient Christians to pay the most careful attention to chronology and historical studies, producing as the result works like "The Chronicle of Eusebius," to which secular history itself owes the greatest obligations. III We notice again in this connection the place where the Apostles met, and the manner in which they continued to assemble after the ascension, and while they waited for the fulfilment of the Master’s promise: "They returned unto Jerusalem, and they went up into an upper chamber." Round this upper room at Jerusalem has gathered many a story dating from very early ages indeed. The upper room in which they assembled has been identified with the chamber in which the Last Supper was celebrated, and where the gift of the Holy Ghost was first received, and that from ancient times. Epiphanius, a Christian writer of the fourth century, to whom we owe much precious information concerning the early ages of the Church, tells us that there was a church built on this spot even in Hadrian’s time, that is, about the year 120 A.D.38 The Empress Helena, again, the mother of Constantine the Great, identified or thought she identified the spot, and built a splendid church to mark it out for all time; and succeeding ages have spent much care and thought upon it. St. Cyril of Jerusalem was a writer little referred to and little known in our day, who yet has much precious truth to teach us. He was a learned bishop of Jerusalem about the middle of the fourth century, and he left us catechetical lectures, showing what pains and trouble the Early Church took in the inculcation of the fundamental articles of the Christian creed. His catechetical lectures, delivered to the candidates for baptism, contain much valuable evidence of the belief, the practice, and the discipline of the early ages, and they mention among other points the church built upon Mount Zion on the spot once occupied by this upper room. The tradition, then, which deals with this chamber and points out its site goes back to the ages of persecution; and yet it is notable how little trouble the book of the Acts of the Apostles takes in this matter. It is just the same with this upper chamber as with the other localities in which our Lord’s mighty works were wrought. The Gospels tell us not where His temptations occurred, though man has often tried to fix the exact locality. The site of the Transfiguration and of the true Mount of Beatitudes has engaged much human curiosity; the scene of Peter’s vision at Joppa and of St. Paul’s conversion on the road to Damascus, -all these and many other divinely honoured localities of the Old as well as of the New Testament have been shrouded from us in thickest darkness, that we might learn not to fix our eyes upon the external husk, the locality, the circumstances, the time, which are nothing, but upon the interior spirit, the love, the unity, the devotion and self-sacrifice which constitute in the Divine sight the very heart and core of our holy religion.39 They assembled themselves, too, in this upper chamber in a united spirit, such as Christianity, though only in an undeveloped shape, already dictated The Apostles "continued steadfastly in prayer, with the women also, and Mary, the mother of Jesus." The spirit of Christianity was, I say, already manifesting itself. Can any contrast be greater or more striking between the inspired narrative, composed for the purpose of ministering to godly life and practice, and such legendary fables as this, invented to gratify mere human curiosity, or to secure a temporary controversial triumph? The Divine narrative shrouds in thickest darkness details which have no spiritual significance, no direct bearing on the work of man’s salvation. The human fable intrudes into the things unseen, and revels with a childish delight in the regions of the supernatural and miraculous. What a striking likeness do we trace between the composition of the Acts and of the Gospels in this direction! The self-restraint of the evangelical writers is wondrous. Had the Evangelists been mere human biographers, how they would have delighted to expatiate on the childhood and youth and earlier years of Christ’s manhood. The apocryphal Gospels composed in the second and third centuries show us what Our Gospels would have been had they been written by men destitute of an abundant supply of the Divine Spirit. They enter into the most minute incidents of our Lord’s childhood, tell us of His games, His schoolboy days, of the flashes of the supernatural glory which ever betrayed the awful Being who lay hidden beneath. The Gospels, on the other hand, fling a hallowed and reverent veil over all the details, or almost all the details, of our Lord’s early life. They tell us of His birth, and its circumstances and surroundings, that we might learn the needful lesson of the infinite glory, the transcendent greatness of lowliness and humiliation. They give us a glimpse of our Lord’s development when twelve years old, that we may learn the spiritual strength and force which are produced through the discipline of obedience and patient waiting upon God; and then all else is concealed from human vision till the hour was come for the manifestation of the full-orbed God-Man. And as it was with the Eternal Son, so was it with that earthly parent whom the consensus of universal Christendom has agreed to honour as the type of devout faith, of humble submission, of loving motherhood. Fable has grown thick round her in mere human narrative, but when we turn to the inspired Word, whether in the Gospels or in the Acts, -for it is all the same in both, -we find a story simple, restrained, and yet captivating in all its details, ministering indeed to no prurient curiosity, yet rich in all the materials which serve to devout meditation, culminating in this last record, where the earthly parent finally disappears from out of sight, eclipsed by the heavenly glory of the Divine Son:—"These all continued stedfastly in prayer, with the women, and Mary, the mother of Jesus." IV And then we have the record of the apostolic election, which is rich in teaching. We note the person who took the first step, and his character, so thoroughly in unison with that picture which the four Gospels present. St. Peter was not a forward man in the bad sense of the word, but he possessed that energetic, forcible character to which men yield a natural leadership. Till St. Paul appeared St. Peter was regarded as the spokesman of the apostolic band, just as during our Lord’s earthly ministry the same position was by tacit consent accorded to him. He was one of those men who cannot remain inactive, especially when they see anything wanting. There are some men who can see a defect just as clearly, but their first thought is, What have I to do with it? They behold the need, but it never strikes them that they should attempt to rectify it. St. Peter was just the opposite: when he saw a fault or a want his disposition and his natural gifts at once impelled him to strive to rectify it. When our Lord, in view of the contending rumours afloat concerning His ministry and authority, applied this searching test to His Apostles, "But whom do ye say that I am?" it was Peter that boldly responded, "Thou art the Christ, the Son of the living God." Just as a short time afterwards the same Peter incurred Christ’s condemnation when he rebuked the Saviour for the prophecy of His forthcoming death and humiliation. The character of St. Peter as depicted in the Gospels and the Acts is at unison with itself. It is that of one ever generous, courageous, intensely sympathetic, impulsive, but deficient, as impulsive and sympathetic characters often are, m that staying power, that capacity to bear up under defeat, discouragement, and darkness which so conspicuously marked out the great Apostle of the Gentiles, and made him such a pillar in the spiritual temple of the New Jerusalem. Yet St. Peter did his own work, for God can ever find employment suitable to every type of that vast variety of temperament which finds shelter beneath the roof of Christ’s Church. St. Peter’s impulsiveness, chastened by prayer, solemnised by his own sad personal experience, deepened by the bitter sorrow consequent on his terrible fall, urged him to take the first conscious step as the leader of the newly-constituted society. How very similar the Peter of the Acts is to the Peter of St. Matthew; what an undesigned evidence of the truth of these records we trace in the picture of St. Peter presented by either narrative! Just as St. Peter was in the Gospels the first to confess at Caesarea, the first to strike in the garden, the first to fail in the high priest’s palace, so was he the first "to stand up in these days in the midst of the brethren," and propose the first corporate movement on the Church’s part. Here again we note that his attitude at this apostolic election proves that the interviews which St. Peter held with Christ after the Resurrection must have been lengthened, intimate, and frequent, for St. Peter’s whole view of the Christian organisation seems thoroughly changed. Christ had continued with His Apostles during forty days, speaking to them of the things concerning the kingdom of God; and St. Peter, as he had been for years one of the Lord’s most intimate friends, so he doubtless still held the same trusted position in these post-resurrection days. The Lord revealed to him the outlines of His kingdom, and sketched for him the main lines of its development, teaching him that the Church was not to be a knot of personal disciples, dependent upon His manifested bodily presence, and dissolving into its original elements as soon as that bodily presence ceased to be realised by the eye of sense; but was rather to be a corporation with perpetual succession, to use legal language, whose great work was to be an unceasing witness to Christ’s resurrection. If Peter’s mind had not been thus illuminated and guided by the personal instruction of Christ, how came it to pass that prior to the descent of the Spirit the Apostles move with no uncertain step in this matter, and unhesitatingly fill up the blank in the sacred college by the election of Matthias into the place left vacant by the terrible fall of Judas? The speech of St. Peter and the choice of this new Apostle reflect light back upon the forty days of waiting. No objection is raised, no warm debate takes place such as heralded the solution of the vexed question concerning circumcision at the council of Jerusalem; no one suggests that as Christ Himself had not supplied the vacancy the choice should be postponed till after the fulfilment of the Master’s mysterious promise, because they were all instructed as to our Lord’s wishes by the conversations held with Christ during His risen and glorified life. Let us pause a little to meditate upon an objection which might have been here raised. Why fill up what Christ Himself left vacant? some shortsighted objector might have urged; and yet we see good reason why Christ may have omitted to supply the place of Judas, and may have designed that the Apostles themselves should have done so. Our Lord Jesus Christ gifted His Apostles with corporate power; He bestowed upon them authority to act in His stead and name; and it is not God’s way of action to grant power and authority, and then to allow it to remain unexercised and undeveloped. When God confers any gift He expects that it shall be used for His honour and man’s benefit. The Lord had bestowed upon the Apostles the highest honour, the most wondrous power ever given to men. He had called them to an office of which He Himself had spoken very mysterious things. He had told them that, in virtue of the apostolic dignity conferred upon them, they should in the regeneration of all things sit upon thrones, judging the twelve tribes of Israel. He had spoken, too, of a mysterious authority with which they were invested, so that their decisions here upon earth would be ratified and confirmed in the region of heavenly realities. Yet when a gap is made by successful sin in the number of the mystical twelve, who are to judge the twelve tribes, He leaves the selection of a new Apostle to the remaining eleven, in order that they may be compelled to stir up the grace of God which was in them, and to exercise the power entrusted to them under a due sense of responsibility. The Lord thus wished to teach the Church from the earliest days to walk alone. The Apostles had been long enough depending on His personal presence and guidance, and now, that they might learn to exercise the privileges and duties of their Divine freedom, He leaves them to choose one to fill that position of supernatural rank and office from which Judas had fallen. The risen Saviour acted in grace as God ever acts in nature. He bestowed His gifts lavishly and generously and then expected man to respond to the gifts by making that good use of them which earnest prayer, sanctified reason, and Christian common-sense dictated. St. Peter’s action is notable, too, in another aspect. St. Peter was undoubtedly the natural leader of the apostolic band during those earliest days of the Church’s history. Our Lord Himself recognised his natural gifts as qualifying him to fulfil this position. There is no necessity for a denial on our part of the reality of St. Peter’s privilege as contained in such passages as the verse which says, "I will give unto thee (Peter) the keys of the kingdom of heaven." He was eminently energetic, vigorous, quick in action. But we find no traces of that despotic authority as prince of the Apostles and supreme head over the whole Church with which some would fain invest St. Peter and his successors. St, Peter steps forward first on this occasion, as again on the day of Pentecost, and again before the high priest after the healing of the impotent man, and yet again at the council of Jerusalem; for, as we have already noted, St. Peter possessed in abundance that natural energy which impels a man to action without any desire for notoriety or any wish to thrust himself into positions of undue eminence. But then on every occasion St. Peter speaks as an equal to his equals. He claims no supreme authority; no authority, in fact, at all over and beyond what the others possessed. He does not, for instance, on this occasion claim the right as Christ’s vicar to nominate an Apostle into the place of Judas. He merely asserts his lawful place in Christ’s kingdom as first among a body of equals to suggest a course of action to the whole body which he knew to be in keeping with the Master’s wishes, and in fulfilment of His revealed intentions. After St. Peter had spoken, two persons were selected as possessing the qualifications needful in the successor of Judas. Then when the Apostles had elected they prayed, and cast lots as between the two, and the final selection of Matthias was made. Questions have sometimes been raised as to this method of election, and attempts have been sometimes made to follow the precedent here set. The lot has at times been used to supersede the exercise of human judgment, not only in Church elections, but in the ordinary matters of life; but if this passage is closely examined, it will be seen that it affords no justification for any such practice. 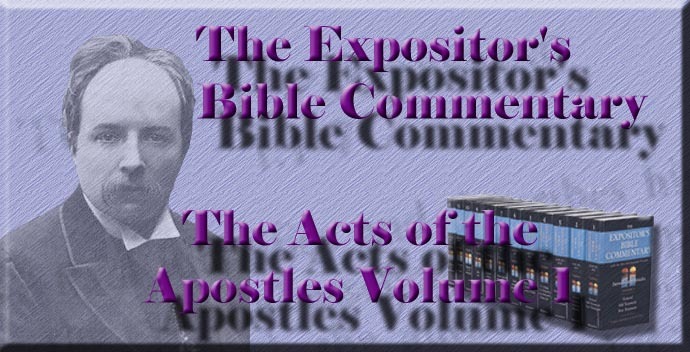 The Apostles did not use the lot so as to supersede the exercise of their own powers, or relieve them of ‘that personal responsibility which God has imposed on men, whether as individuals, or as gathered in societies civil or ecclesiastical. The Apostles brought their private judgment’ into play, searched, debated, voted, and, as the result, chose two persons equally well qualified for the apostolic office. Then, when they had done their best, they left the decision to the lot, just as men often do still; and if we believe in the efficacy of prayer and a particular Providence ordering the affairs of men, I do not see that any wiser course can ever be taken, under similar circumstances, than that which the Apostles adopted on this occasion. But we must be careful to observe that the Apostles did not trust to the lot absolutely and completely. That would have been trusting to mere chance. They first did their utmost, exercised their own knowledge and judgment, and then, having done their part, they prayerfully left the final result to God, in humble confidence that He would show what was best. The two selected candidates were Joseph Barsabas and Matthias, neither of whom ever appeared before in the story of our Lord’s life, and yet both had been His disciples all through His earthly career. What lessons for ourselves may we learn from these men! These two eminent servants of God, either of whom their brethren counted worthy, to succeed into the apostolic College, appear just this once in the sacred narrative, and then disappear for ever. Indeed it is with the Apostles as we have already noted in the case of our Lord’s life and the story of the Blessed Virgin, the self-restraint of the sacred narrative is most striking. What fields for romance! What wide scope for the exercise of imagination would the lives of the Apostles have opened out if the writers of—our sacred books had not been guided and directed by a Divine power outside and beyond themselves. We are not, indeed, left without the materials for a comparison in this respect, most consoling and most instructive for the devout Christian. Apocryphal histories of all the Apostles abound on every side, some of them dating from the second century itself. Many of them indeed are regular romances. The Clementine Homilies and Recognitions form a religious novel, entering into the most elaborate details of the labours, preaching, and travels of the Apostle Peter. Every one of the other Apostles, and many of the earliest disciples too, had gospels forged in their honour; there was the Gospel of Peter, of Thomas, of Nicodemus, and of many others. And so it was with St. Matthias.43 Five hundred years after Christ the Gospel of Matthias was known and repudiated as a fiction. A mass of tradition, too, grew up round him, telling of his labours and martyrdom, as some said in Ethiopia, and as others in Eastern Asia. Clement, a writer who lived about the year 200, at Alexandria, recounts for us some sayings traditionally ascribed to St. Matthias, all of a severe and sternly ascetic tone. But in reality we know nothing either of what St. Matthias did or of what he taught. The genuine writings of apostolic times carry their own credentials with them in this respect. They are dignified and natural. They indulge in no details to exalt their heroes, or to minister to that love of the strange and marvellous which lies at the root of so much religious error. They were written to exalt Christ and Christ alone, and they deal, therefore, with the work of Apostles merely so far as the story tends to increase the glory of the Master, not that of His servants. Surely this repression of the human agents, this withdrawal of them into the darkness of obscurity, is one of the best evidences of the genuineness of the New Testament. One or two of the earliest witnesses of the Cross have their story told at some length. Peter and Paul, when compared with James or John or Matthias, figure very largely in the New Testament narrative. But even they have allotted to them a mere brief outline of a portion of their work, and all the rest is hidden from us. The vast majority even of the Apostles have their names alone recorded, while nothing is told concerning their labours or their sufferings. If the Apostles were deceivers, they were deceivers who sought their rewards neither in this life, where they gained nothing but loss of all things, nor in the pages of history, where their own hands and the hands of their friends consigned their brightest deeds to an obscurity no eye can pierce.44 But they were not deceivers. They were the noblest benefactors of the race, men whose minds and hearts and imaginations were filled with the glory of their risen Redeemer. Their one desire was that Christ alone should be magnified, and to this end they willed to lose themselves in the boundless sea of His risen glory. And thus they have left us a noble and inspiriting example. We are not apostles, martyrs, or confessors, yet we often find it hard to take our part and do our duty in the spirit displayed by Matthias and Joseph called Barsabas. We long for public recognition and public reward. We chafe and fret and fume internally because we have to bear our temptations and suffer our trials and do our work unknown and unrecognised by all but God. Let the example of these holy men help us to put away all such vain thoughts. God Himself is our all-seeing and our ever-present Judge. The Incarnate Master Himself is watching us. The angels and the spirits of the just made perfect are witnesses of our earthly struggles. No matter how low, how humble, how insignificant the story of our spiritual trials and struggles, they are all marked in heaven by that Divine Master who will at last reward every man, not according to his position in the world, but in strict accordance with the principles of infallible justice. See on this point Dr. John Lightfoot's Horæ Hebraicæ , Acts ii. 1; and a sermon by the learned Joseph Mede of Cambridge on Deut. xvi. 16, 17, in his Works , vol. i., p. 350 (London, 1664). See this point worked out in Dr. Salmon's article Chronica , in the first volume of the Dict. Christ. Biog. , and in the opening of his article on The Chronicle of Eusebius in the second volume of the same work. A brief extract from one of the earliest and most learned apologists, who lived about the middle of the second century, will show how the Christians elaborated this argument. Tatian, in ch. xl. of his Oration to the Greeks , speaks thus: "Therefore from what has been said it is evident that Moses was older than the ancient heroes, wars, and demons. And we ought rather to believe him, who stands before them in point of age, than the Greeks, who, without being aware of it, drew his doctrines as from a fountain. For many of the sophists among them, stimulated by curiosity, endeavoured to adulterate whatever they learned from Moses, and from those who philosophised like him, first that they might be considered as having something of their own, and secondly, that covering up by a certain rhetorical artifice whatever things they did not understand, they might misrepresent the truth as if it were a fable. But what the learned among the Greeks have said concerning our polity and the history of our laws, and how many and what kind of men have written of these things, will be shown in the treatise against those who have discoursed of Divine things." Epiphanius, On Weights and Measures , ch. xiv. The traditions about the upper chamber are given at length in Fr. Quaresmius, Terræ Sanctæ Elucidatio , t. ii., p. 119 (Antwerp, 1639), with which may be compared Bingham's Antiquities , bk. viii., ch. i., sec. 13; Mede's Discourse Of Churches in his Works , vol. i., p. 408; and Bishop Milles' notes on Cyril's Catech. , xvi. 2, in his edition of that writer, p. 225. See, for a fuller account, Salmon's Introduction N. T. , 4th ed., pp. 384-86, and the references there given. Peter may have learned this mystical mode of interpretation from our Lord Himself in His conversations. See Luke xxiv. 44-9. The intimate connection between the Christian ministry and the miraculous facts of Christianity has been powerfully argued by Charles Leslie in his Short and Easy Method with the Deists . He contends that the existence of the Christian ministry is a standing evidence of the supernatural facts of the gospel which can alone explain that existence. If the facts never happened, how did the Christian ministry arise? Hence he concludes the perpetual character and obligation of the ministry for Christians, or, to quote his own words, "Now the Christian priesthood, as instituted by Christ Himself, and continued by succession to this day, being as impregnable and flagrant a testimony to the truth of the matter of fact of Christ as the sacraments or any other public institutions; besides that, if the priesthood were taken away, the sacraments and other public institutions which are administered by their hands, must fall with them: therefore the devil has been most busy, and bent his greatest force, in all ages, against the priesthood, knowing that if that goes down, all goes with it. "—Leslie's Works , vol. i., p. 27. The literature of the apocryphal Gospels is very extensive. Those who wish to pursue this subject will find abundant materials in an article on "Gospels, Apocryphal" in the second volume of the Dictionary of Christian Biography , written by Professor Lipsius of Jena; or in Dr. Salmon's Introduction to the New Testament , Lect. XI. Origen mentioned the Gospel of Matthias, while again Eusebius ( H. E. , iii., 25) describes it as heretical. See Fabricius, Cod. Apoc. N. T. p. 782. The apocryphal Acts of Andrew and Matthias may be seen in Tischendorf's Acta Apoc. , p. 132. Nelson's Fasts and Festivals tells, in a convenient shape, the traditions about St. Matthias and the other Apostles. The dignified self-restraint of the Acts is nowhere more manifest than in its reference to Judas Iscariot. The only notice bestowed upon him is connected with the election of Matthias. Papias was a writer of the beginning of the second century. He knew some of the Apostles and early disciples, and gathered diligently every tradition about the Church's early days. Papias made an attempt to harmonise the account of the death of Judas given by St. Peter with that told in St. Matthew, which has been preserved for us by two Greek commentators, Œcumenius, who lived in the tenth, and Theophylact, who flourished in the eleventh century. The difficulty is this. St. Matthew says that Judas hanged himself; St. Peter says that he burst asunder. Papias harmonises the two by telling that Judas first of all hanged himself on a fig-tree, but the halter broke. He was then seized with a terrible dropsy, and swelled up to an enormous size, so that when endeavouring to pass where a waggon could go he burst asunder. The narrative of Papias is given in Theophylact on Matt. xxvii., and Œcumenius on Acts i. Dr. Routh, in his Reliquiæ Sacræ , vol. i., pp. 9, 25, points out that the horrid details of the story, which cannot be here printed, are due to the Greek commentators enlarging on the simple facts stated by Papias. Origen, with characteristic daring, suggests that Judas committed suicide as soon as he saw that our Lord was condemned, in order that he might arise in the region of the dead before Him, and there seek His forgiveness. There is a curious Latin book, published in 1680, which gives all the traditions about the traitor. Its title is Kempius, On the Life and Fate of Judas Iscariot .